Friends of Tribals Society, Coimbatore Chapter has been getting continuous support from Rotary Club of Coimbatore Midtown. They have sponsored 11 schools for this year. They felicitated FTS in their weekly meeting. The meeting began with Rotary Prayer & Ekal children prayer. The President of the club Rtn. C.S. Sudaram gave welcome address. Smt. Hemamalini – South zone Co-ordinator, Ekal Movement, explained about the Ekal field working systems and recent development in the field. Sri Shreegopal Maheshwary, President, FTS Coimbatore chapter, briefed about the chapter activities. Finally Rtn. Pragash A.B. Angappan proposed vote of thanks. The meeting concluded with National anthem. ‘River festival’ was celebrated on 25th June by Ekal Karyakartas in Cuddalore, Tamilnadu in a very big way. 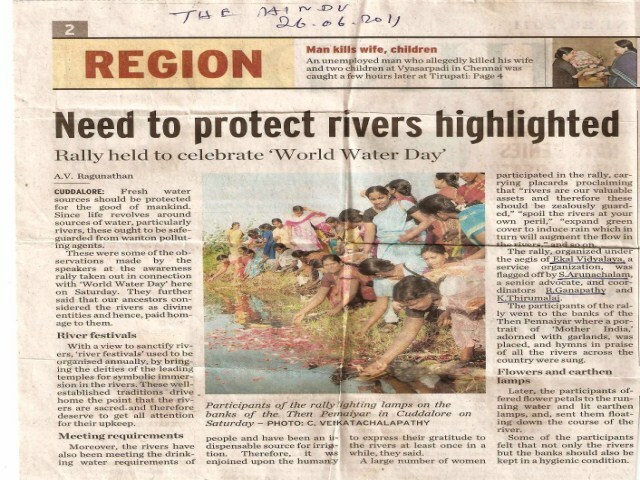 A rally was held to create awareness for saving rivers. The program was covered in many news papers. An article was published by ‘The Hindu’ newspaper, one of the leading daily English newspapers of India. The Gramothan Resource Centre of Ekal Vidyalaya Movement, Tamilnadu was inaugurated in Kumbakonam on 16th July, 2011 by Dr. Krishnan lighting the lamp. Dr. Krishnan is the Managing Trustee of one of the biggest ITI in Tamilnadu. Sri J.K. Jhaver, Industrialist from Chennai & the Convener of Gramothan Yojana announced the Managing Committee of this centre having 5 members. Sri Thalapathy, Agriculturist from local area was elected the President of this committee. Announcing the team, Sri J.K. Jhaver blessed them and wanted them to make this centre as the best and model centre for the whole country. Sri M.Balasubramanyam, Vice President of Friends of Tribals Society, Chennai gave the benedictory address and he promised all the coordination from FTS Chapter for this purpose. Dr. C.Satheesh Kumar, Project Coordinator of Ekal Vidyalaya Foundation of India spoke on the concept of Gramothan Yojana and the role of Ekal Vidyalaya Movement.Dr. Ramanan, Director of Meteorological Department of Tamilnadu, Dr. Jaganmohan, Senior Scientist from Indian Institute of Crop processing Technology and Sri Aravindan Neelakandan from Natural Resources Development program of Vivekananda Kendra, Kanyakumari, gave presentations about the working of their departments and promised all the cooperation for this centre. The First batch of Training also started on the same day. The Master Trainer is Sri K.E.N. Raghavan. Others present on the occasion were Sri & Smt. B.K. Jalan, of the Gramothan Foundation, Sri Senthur Pari, EC member of Ekal Vidyashram (SVO of Tamilnadu), Smt. Manjulika Jhaver, Parampara, Chennai, Smt. Hema Malini, Bhag Pramukh of Ekal. Around 100 villagers from nearby villages and around 50 Ekal Vidyalaya teachers and fulltime workers were also present on the occasion. An article on Friends of Tribals Society was published in Punjab Kesari on 27th July, 2011. The article provides detailed information about FTS activities. Punjab Kesari is a leading Hindi daily newspaper of North India. I would have regretted forever if I had declined the invitation of Sri Rajendra Khaitanji to accompany him and Sri Nand Todi of USA to visit schools in the difficult terrain of J&K. On Sunday, the 3rd July 2011, our team of a dozen reached Jammu. The team included Sri Khaitan, Trustee, EVFI his wife and daughter, Sri Todi, his wife and daughter, Sri Ashok Pal of the Vidya Bharati, Sri Gauri, Vice-President, EVFI, Smt Sangeeta Gupta, Secretary, EVFI, Sri Puneet Raman, me and my wife. From the station we went to the Ved Mandir complex where the offices of Ekal and Bhartiya Siksha Samiti are also situated. After getting fresh, we started for Udhampur on way to Bhaderwah via Doda. The ongoing Amar Nath Yatra did hamper our drive and we could reach Udhampur only after noon. In Udhampur, we had the opportunity of meeting with the local committee members looking after the Vidya Bharati school there. They were wonderful hosts who had to arrange for a fast lunch instead of the breakfast that they had planned. In Udhampur we also had the opportunity of visiting the Vidya Bharati school. From here we started on our journey to Bhaderwah and reached our destination in the evening. The drive from Udhampur to Bhaderwah, along the Chenab river, was breathtaking. The scenic beauty can not be described in a few lines here. Let me suffice to say that we keep on going abroad on our holidays but do make it a point to visit these areas too. At Bhaderwah after having tea, we immediately set out for visiting an Ekal school, some six kms from the town. On way we also saw a Vidya Bharati school for primary students. Further construction work in this school is in progress. 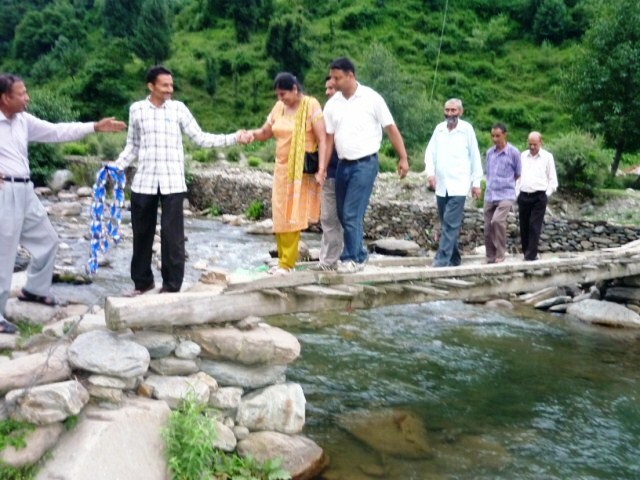 To reach to the village where the Ekal school was functioning we had to cross a small river on a very thin bridge made of locally available wooden planks. Because of fear some of us had our hands held by the local volunteers while crossing. Some 500 meters climb brought us to a flat area where the school was running in a shed provided by the owner of the house. After the lighting of lamp by Sri Todi and his wife, the regular prayers and the class was efficiently conducted by the young lady teacher, Kiran. Kiran is the daughter-in-law of the villager who has given this premise for conducting Ekal classes. The guests from America were enchanted with the performance of the students there. And they had a lot of questions for the students and the teacher which were satisfactorily replied to. There were 26 students attending. We also got the opportunity of meeting with the parents of these students and the local village committee members. Three other teachers of nearby Ekal schools had also come to meet us and thus we could interact with them also about the performance in their schools. 1. At the time we were in the village seeing the school and interacting with the children and villagers it had gone dark. We were told that only four to five years back at such an hour no one would be outside in open. The fear of terrorism would keep them indoors, but no more. 2. The parents were very happy with the teachings in Ekal. They openly confessed that they did not go to schools and did not learn such values but were thankful to Ekal that their children are getting this opportunity. And from their children they are also learning many other things. 3. The villagers said that Ekal has helped in bringing all to one platform. 4. This is an area where most people do take alcohol, locally made or otherwise, regularly but on the days when weekly ‘satsangs’ are held they do not drink. This has not only let to greater harmony in the household but also in the village. 5. The women-folk said with pride that they have now re-learnt the prayers from their children that they had forgotten long back. 6. We were informed that in Ekal there was no caste discrimination and children from different castes sat together in the Ekal schools of the area. We started our return journey at around 8 p.m. It had gone dark and with the help of two solar lanterns and a gas lantern we once again managed to cross the bridge with help from the local volunteers. Coming back to Bhaderwah we got the opportunity to meet some sixty full time volunteers of Ekal working in such difficult circumstances. It was a pleasure to interact with them and some of the incidents that they narrated were an eye opener for all of us. The next day before leaving Bhaderwah on our way back to Jammu we visited two schools run by Vidya Bharati. Though it was a state holiday, the management of the two schools were able to call some students and teachers to show us around. We could see and feel the wonderful work and the service being given to the society by Vidya Bharati here. If more resources are made available Vidya Bharati has plans to open more schools in the area. On way to Jammu near Doda we were shown another location where land has been bought for another school of Vidya Bharati. In the afternoon we reached Patnitop and spent the night there. The next morning we left for Jammu and reached in the afternoon. In Jammu the local team of the SVO looking after Ekal work had assembled and we had a one to one discussion on the working of Ekal schools in J&K. The president of the SVO informed us that 1958 Ekal schools were functioning in the state and gave details of the district wise figures. To our surprise he informed us that the local team had decided to take one ‘vanyatra’ every quarter and they have already had two such ‘vanyatras’ and the next will also be on schedule. The ‘vanyatra’ has given them very good outcome with more support coming. The team that had come to meet us, fourteen of them, were mostly engineers – some of them retired and some working. There was an agricultural officer of the government also in the team. All looked so dedicated to the Ekal cause. The experience of the three day visit to the area – interaction with the local people, with the committee members, with the full time volunteers – all told us one thing very loudly that the work that Ekal is doing is good and they need the presence of Ekal in more villages. The same sentiments are expressed elsewhere in the country. Though the Sarva Siksha Abhiyan schools have also come in many villages, still the need of Ekal Vidyalayas is felt by all. People do look for value education which they feel must be inculcated in the early part of life. Added to the basic education the people are happy with the other education programmes that Ekal undertakes, thus ensuring a comprehensive village development scheme. Our efforts to make more resources available have to be increased many fold. Arjun and Yashodhara, both teenagers from Florida, USA visited Ekal Vidyalayas at Alwar. They were accompanied by Sri Vijay Sethi and Dr. Kailash Gupta (both from EVFI). The team from Delhi was given a warm welcome by putting Tilak and garlanding. After a short interview by the local TV News Channel and breakfast at Sri Rajesh Bansal’s residence, the team accompanied by Alwar Chapter team reached Khilora village in Ramgarh sanch, 35 kilometers from Alwar. The villagers honored the team members by tying Phetas (Turbans) on their heads and Yashodhara with a colourful Chunni. Arjun riding on horse back and others on camel cart were taken to Ekal Vidyalaya. The children at the Vidyalaya started with OM recitation and Sarasvati Vandana. They recited poems and tables. Arjun and Yashodhara appreciated their skills of solving addition, subtraction, division, multiplication and basic maths operations. Arjun and Yashodhara distributed sweets to the children and interacted with the villagers also. Village Mevkhera, ten kilometers to the south of the former village, was the next stop for this Vanyatra team. Children recited Gayatri Mantra and poems. Arjun and Yashodhara interacted with the children, took their photographs while they were reciting poems and writing their names on the blackboard. All the team members proceeded to take their lunch at the Sarpanch’s residence. The lunch was served with traditional simple way and taken by sitting on the floor. Both Arjun and Yashodhra enjoyed the natural hilly surroundings. The camel and horse ride, camel carts were being used for ferrying goods, the sight of cows, buffalos and sheeps. They recorded all these sights on their cameras. The villagers and children living in such difficult conditions was really an exclusive experience for Arjun and Yashodhara. It may be mentioned that Arjun and Yashodhra are active members of the RICE Club collecting funds for Ekal from amongst the students in USA.